Glaucoma isn’t just one eye disease but actually an entire group of eye disorders that leads to optic nerve damage, which could result in vision loss. Sometimes, but not in every case, the damage is caused by unusually high pressure within the eye itself. This condition is one of the main causes of blindness in the U.S. It can damage your eyesight so slowly that you may not even notice any vision loss until the disease has progressed to a more advanced stage. The most common kind is primary open-angle-glaucoma, which literally has no obvious symptoms or signs except the gradual loss of vision. 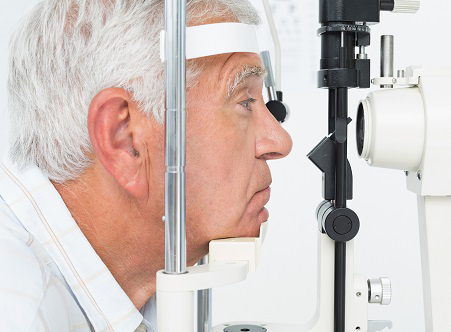 For best results, early detection and treatment is the key to minimizing the disease as much as possible or to prevent further optic nerve damage and decrease the glaucoma-related loss of vision. It’s crucial to get an eye exam on a regular basis. The most common types of Glaucoma related vision loss are Angle-Closure-Glaucoma and Open-Angle-Glaucoma which manifests entirely different symptoms in people. If you are experiencing some or many of these particular symptoms simultaneously, especially if you have eye pressure; seek medical attention immediately at one of our two clinics, Alpharetta Eye Clinic or Windward Eye Care. Both Angle-Closure and Open-Angle-Glaucoma can either be primary or secondary disorders. They’re referred to as primary if the cause isn’t known, and called secondary if the disorder can be traced back to an identifiable cause like an eye injury, tumor, diabetes, advanced cataracts, certain eye disorders, inflammation, or medications. In the secondary type, the symptoms can also mimic those of the primary disorder along with regular glaucoma-related symptoms. It’s not recommended that you wait to visit one of our locations when you begin to notice problems with your eyes. In fact, Open-Angle-Glaucoma shows very few symptoms until the damage is already well underway. Getting your eyes checked on a regular basis is key to identifying any eye disorders early enough in order to effectively treat it and to avoid further development of the condition. It’s highly advised by the American Academy of Ophthalmology that you get a thorough eye exam beginning at age 40 for adults, and every 4 – 5 years thereafter if you’re not at risk for developing the disorder. If you’re more than 60 years of age and have additional risk factors, you should ideally get screened each year. If your ethnicity is African-American, your healthcare professional will probably suggest getting regular eye exams beginning around 20 – 40 years of age. Glaucoma: More than 3 million people in the US are living with glaucoma; 2.7 million of whom—aged 40 and older—are affected by its most common form, open-angle glaucoma. Since the population is aging, the numbers will undoubtedly increase in the coming years. If you are over 40, get checked. Make the right decision for your vision. Call one of our Alpharetta locations today.